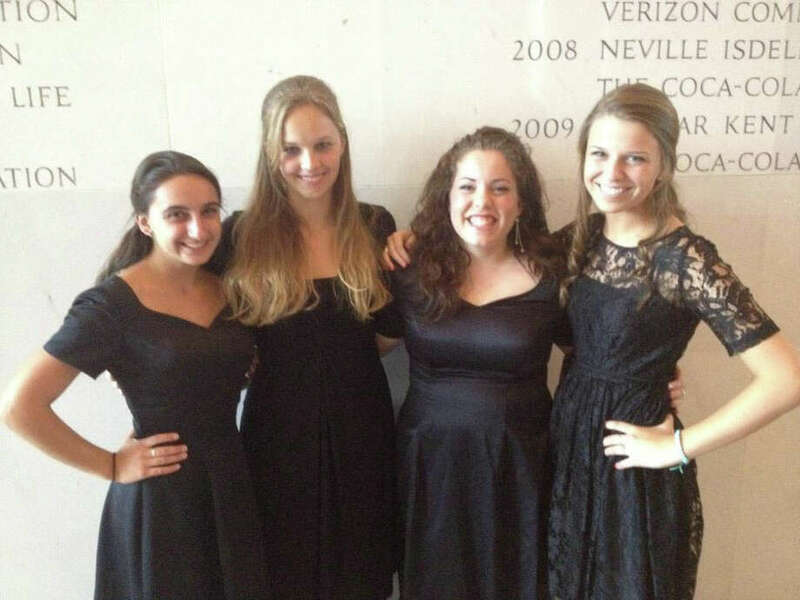 Hannah Caldwell, third from left, is the first Darien student to perform with the All-National Honors Chorus in Washington, D.C. She is pictured with fellow chorus members. July 13, 2012, Darien, Conn.
Hannah Caldwell, a 2012 Darien High School graduate, was chosen through a rigorous audition and application process to participate in the National Association for Music Education 2012 National Honors Choir, which took place in Washington June 21 to 24. Caldwell was a member of the DHS Tudor Singers and has been a member of the Connecticut Western Region and All-State Choruses for the past several years. The National Honors Choir was made up of outstanding musicians from throughout the United States and was conducted by professor Sandra Snow of Michigan State University. The concert took place at the Kennedy Center in Washington. She is the first student from Darien High School to be chosen to perform in the choir. "Being one of 20 first sopranos in the All-National Choir was a huge honor and a truly amazing experience," Caldwell said. "Singing with kids -- and hearing those in the orchestra, concert band and jazz band -- from all over the country who came from so many different backgrounds was so much fun. The level of talent and dedication in all the performers demonstrated why they were part of an All National ensemble and allowed us to all come together and make beautiful music with only three days of rehearsal. "Meeting and rehearsing with the other participants and getting a private performance from the president's own Marine Band were wonderful, but the most amazing part of the whole trip was performing at the Kennedy Center. The first time we walked into the dressing room, I got chills and walking onto that stage was humbling, to say the least. "I am so grateful to the music program in the Darien public schools for providing me with an excellent education, and especially to my voice teacher, Kathryn Amyotte, who helped me develop my potential and has positioned me to continue to grow as an artist. Next year, I will continue my studies in music at NYU and will work hard so that I can have another chance to perform at the Kennedy Center."